Please contact Ashley Odil to be added to the wait list at aodil@portlandalliance.com or 503-552-6742. Let's celebrate the amazing women working in the Portland region and beyond! Join us for the 2018 A Place With No Ceiling event to recognize women's leadership in business. 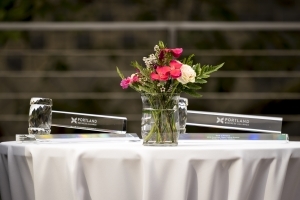 This year, we are proud to honor Maria Pope, president and CEO of Portland General Electric, with the newly-dedicated Sandra K. McDonough Leadership Award and U.S. Bank with the company award for their advancement of women in the workforce. Cocktail Reception at 4:00 p.m.
Hors d'oeuvres and one complementary drink will be served. Pre-registration required. You cannot use event credits for this event.